In the mid-seventh century, the ruling family in Yamato maintained an unstable hegemony over the confederation of other uji at the Yamato court. Military defeats in Korea, the rise of the Tang dynasty in China, and the increasing economic, military, and political power of other uji dictated that the Yamato clan take decisive action to preserve their position. That action was the Taika Reforms of 645, which initiated a process of centralisation culminating in the ritsuryō system modelled on the Chinese experience. The most revolutionary reform was in the landholding system. The ritsuryō system provided for central government (imperial) control of Japan’s rice paddy land and productive human labour. This was in sharp contrast to the existing system whereby the various uji controlled private lands (田所 tadokoro) and the labour groups on those lands. Although the general principle was accepted, the ritsuryō system never functioned as envisioned. The main reason was that the Yamato ruling house did not possess sufficient military superiority to force other uji to yield control over their extensive resources. To secure cooperation, the Yamato uji, or imperial house, appointed members of the largest uji to bureaucratic positions (gunji) carrying stipends in land and labour. In effect, they became de facto nobles in a newly created imperial system without yielding their economic resources. Uji leaders accepted the change since it appeared to ensure the maintenance, if not the expansion, of their economic interests. Under the ritsuryō system, all land belonged to the government, in the sense that the government tried to exercise administrative control and taxation rights over the land. The land allotment system (班田収授 handen shūju) provided that rice land would be distributed in fixed amounts to free males and females and slaves of both sexes. Such properties were called kubunden (口分田, allotment lands) and were to be kept as long as the recipient lived. The members of households then pooled their allotment lands for cultivation. To record the lands and the people to whom it was allotted, a census was to be compiled every six years; the land would then be redistributed if the composition of a household had changed. New eligible members would receive lands, and lands held by deceased members would revert to the state. Cultivators were allowed to work the lands for their lifetime, provided they paid the taxes the state levied upon them. There were primarily three: a rice tax (租 so), probably 3 to 5 percent; a tax in kind (調 chō, paid mostly in cloth); and corvée (徭役 yōeki), the most onerous burden of all, perhaps as much as hundred days for males aged 21 to 60 (20 to 59 in Western reckoning), for which a substitute tax (庸 yō) might be paid in lengths of cloth. Military corvée was levied on the population, too. From the beginning, the system did not function properly because it was necessary to accommodate the interests of powerful uji to ensure cooperation. As a result, the uji nobility came to control large tracts of land and the labour of numerous cultivators, but the cultivators themselves fared very poorly and were eager to accept alternative solutions when available. Land-hungry nobles and religious institutions had the capital necessary to open new lands, and their political influence was sufficient to allow such activity despite its illegality. What they needed was labour. Since kubunden farmers could not sustain themselves well on their lands, they were eager for other opportunities. The central government was unable to check these desires because it was faced with an increase in population without a concomitant rise in the amount of rice land in cultivation. The government, therefore, announced its intention in 722 to open one million chō (1 chō equalled about 2.5 acres or one hectare in the eighth century) of land in the northeast, but it could not muster sufficient labour for the project. The next year the government announced a law (sanze isshin no hō) allowing people or institutions to open new rice fields proprietary control for either one or three generations. Finally, in 743 the government found it necessary to grant permanent ownership to anyone who reclaimed new rice lands. This incentive proved successful, and as a result nobles and institutions with capital lured kubunden farmers away from their allotment lands. Thus, the way was paved for the acquisition of private landholdings, a trend counters to the spirit of the ritsuryō system but supported by the highest officials of the government, for whom it was profitable. This was the first step in the expansion of private estates. In 765, an edict was promulgated attempting to rescind the 743 law, but it was too late. The situation continued to deteriorate despite the efforts of Emperor Kammu, who ordered two land redistributions, appointed provincial inspectors to hear farmers’ grievances, and had compiled three land surveys. None of these measures worked. Surveys and censuses revealed great discrepancies in the records, and the inspectors were unable to change the illegal practices of many provincial governors, who colluded with capital nobles to turn allotment fields into private holdings. Furthermore, Kammu’s campaigns against the Ezo increased corvée levies on the peasantry, and his construction of two new capitals further drained their agricultural output as well as their labour. Finally, the emperor decreased the number of provincial governors’ salaries, but this only encouraged them to exploit the cultivators further. The handen shūju system continued to decline after Kammu’s reign. The redistribution of land was accomplished only twice in the ninth century, in 828 and again between 878 and 880. Noble lands – whether in the form of shōen or not – expanded in the ninth century through reclamation, purchase, the occupation of lands left by absconding cultivators, and commendation by cultivators. In 902, a shōen regulation ordinance was promulgated, aimed at limiting the transfer of public lands into private hands, but it succeeded only in curtailing lands of the imperial family, while noble land acquisition continued unabated. By the end of the ninth century, the difficulties of provincial government due to the unworkability of the ritsuryō provisions were of significant concern to great ministers and governors alike. Ministers like Sugawara no Michizane, who had served as a provincial governor, strongly opposed the contradictions of the system, and Fujiwara no Kiyotsura (also known as Miyoshi no Kiyoyuki), in his famous opinion in the Twelve Articles of 914, demonstrated the extent of the problem. The resistance of the cultivators to the onerous ritsuryō levies – by absconding, by falsifying census registers both to avoid losing lands and to escape corvée levies, and by colluding with local or capital influential figures to make their holdings private and evade taxes – had created a crisis for the central government by drastically curtailing its resources, further exacerbating the relationship between local authorities and the central government. Changes were inevitable, and many were being taken by governors on their initiative. Two significant changes were introduced in the provincial government and taxation system during the early tenth century. First, it was necessary to change the ritsuryō system of levying tax and corvée on individuals, since the complex system allowed for great falsification. People were challenging to count, but the land under cultivation was much easier to calculate. Already in most provinces, the interest on government-loaned rice (suiko) was being levied on lands rather than people. What was needed was a unit for administration. The state decided to form myō (名田 myōden), which were essentially taxation units based upon the paddy fields calculated in tan, upon which both rent and corvée could easily be levied. The second major change was that the central government entrusted the particulars of local administration entirely to governors – or their deputies since increasingly the former were absentee governors remaining in the capital – in return for the payment of a stipulated amount of tax revenue, calculated for each province. By this time the kubunden fields no longer existed, reallotment no longer being practised. This did not mean that such lands were now all privatised. Government fields were now lumped together under the general term “public lands” (kōden). 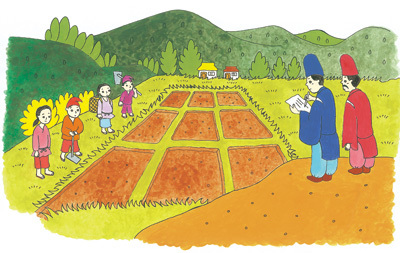 Although the allotment was no longer carried out, the registers of provincial land (国図 ko-kuzu) were still in existence, and these came to be relied upon as a record of the number of kōden, that is, taxable land, in each province. Thus, from the 10th century, the amount of taxable public land in each province was set and divided for exploitative purposes into units called myō. Lands not controlled as kōden were mostly shōen, and the growth of shōen over the course of the eleventh and twelfth century was tremendous. By the end of the Heian Period more than half of Japan’s rice fields were within shōen units, further reducing the amount of taxable kōden, forcing the nobility constituting the central government to seek ever more private shōen revenues to replace lost public income. By the end of the Heian period, shōen had been established in every province of Japan, seriously undermining the public revenue of the state. The system of proprietary control of public lands in the provinces by great nobles meant that these lands too were being treated as private possessions of the proprietor or his local governor-representative. Much of it survived into the Kamakura Period; in fact, the majority of the warriors who rose to power emerged out of public lands, in which they served as hereditary local officials. Nonetheless, the ideal of national control of land and people of the ritsuryō system was long dead by the end of the twelfth century.